I haven’t eaten many burgers on the University City/West Philly side of the city, mostly because the options are limited to fast-casual chains that I’ve already eaten at or bars where college kids hang out that also happen to serve food. However, White Dog Cafe seemed promising, as their farm-to-table, locally sourced menu seemed to cater to something other than the Bud Light & chicken wings crowd. Coming in for happy hour, I went with the double cheddar burger – a patty made of meat from Green Meadow Farm in Lancaster – which came topped with grilled red onion, tomato, lettuce and smoked bacon mayo. The presentation was unique and the burger patty was perfectly proportional to the bun. It was requested medium and was perfectly pink upon first bite. However, it was all downhill from here. The bun had gotten incredibly soggy as a result of the run-off from the patty, despite putting the lettuce underneath it to act as a kind of ‘diaper’. I quickly started to run out of bottom bun as I tried to rectifying the soggy bottom situation. The cheese and the bacon mayo were completely tasteless. The burger had no flavor, wait, scratch that – the burger tasted almost watery and while pink in the middle grew increasingly colder and less edible with each bite. I eventually became so disgusted by the watery taste that I took the lettuce & tomato off in case they were contributing to the weird flavor. They weren’t. That, combined with the incredibly unwelcoming service I received from the staff (which I won’t get into here, as this isn’t Yelp), I didn’t even want to finish the burger. But I eventually did, grabbed the check as quickly as I could, and bolted. I’m just glad that I only paid $10 for this burger rather than the hefty $17 dinner menu price tag. It certainly doesn’t make me excited about eating on that side of the river anytime soon (that is, unless I’m getting Spotburger). I just don’t seem to have much luck at places with “Dog” in the name, it seems – maybe it’s because I’m a cat person? Posted in bacon mayo, bad, buns, burger, cheddar, local, medium, University City, White Dog Cafe. Bookmark the permalink. Once the burger arrived, I could see why the burgers were all cooked to medium. The patty was very wide and thin, kind of like the patties over at The Industry, which means that they cook fast to get that nice, pink center. The brioche bun was soft and buttery, holding up well with each bite, even with a little bloody run-off from the burger. The meat was flavorful and the patty was perfectly proportional to the bun. The bacon could have been a little crispier, but otherwise I couldn’t complain. Topped with sliced roma tomatoes and bibb lettuce, it resembled many of the burgers that I like to make at home. I think I was most excited about it being the correct temperature and finding pink in every bite I took that made the overall burger eating experience the most enjoyable I’ve had in a while. I’m glad I decided to check it out, even if it was one of the least French things on the menu (think they’ll let me add escargots as a topping next time?). Posted in bacon, brioche, buns, cheese, emmental, french, Good King Tavern, medium, South Street. Bookmark the permalink. A friend of mine had been hyping up the burger at Kraftwork for a while now, so I decided it was finally time to check it out (lest I get nagged continuously). It’s not like I’ve never been to Kraftwork before. It’s the starting point for the twice yearly Craft Beer Express and they’ve always got a pretty solid draft list; I’ve just never had a chance to eat here until now. The burger is touted as being a special dry aged blend and comes customizable with an assortment of toppings for 50 cents a pop (lettuce, pickles and one topping are included). I opted to top mine with sharp cheddar and bacon red onion marmalade. You also get a choice of either garlic herbed fries or a mixed green salad as your side. I was planning on partaking in Hot Diggity‘s Fourth of July corn dog special later that day and was saving my deep fried food intake for that, so I went with the salad (who am I?!). The burger came out with a nice presentation: patty situated on top of the pickles and lettuce, fairly proportional to the bun. However, when I picked it up, that’s when things fell apart – literally. A lot of grease came dripping off the back of the burger and the meat started to separate slightly after my first bite. It was also cooked more on the medium-well side then my usual requested medium. Thankfully the grease didn’t make the bun too soggy (probably thanks to the lettuce/pickle “diaper”), but I did have to compensate for the patty coming apart and leaving behind excess bun by eating around the burger instead of head-on. The pickles gave the burger a little bit of crunch and sweetness, as did the bacon-onion marmalade, but there wasn’t a lot of flavor otherwise. After I’d finished, I overheard some people at the table next to me debating who had the best burger in the area; one guy said it used to be this one but now he was leaning towards Interstate Draft House. Maybe I just waited too long to try this burger? I guess next time I’ll listen to my friends and check things out sooner! Posted in bacon red onion marmalade, bar burger, beer, buns, burger, burgers, cheddar, Fishtown, Hot Diggity, Kraftwork, medium. Bookmark the permalink. There’s certainly no shortage of places in Philadelphia to get good food and cocktails. So when Society Hill Society opened in Headhouse Square a few months ago, I knew I’d have to add it to my list. And then all my friends started raving about their burger. “Best burger I ever had!” “Only $8!” “I don’t even like burgers but this was so good!” Once I heard their reviews and saw pictures all over social media of how good it looked, it immediately got bumped to the top. I popped in for brunch on Sunday after checking out the Headhouse Farmers Market, which is where Society Hill Society sources many of its ingredients from. The burger is a no-frills sirloin & brisket blend patty topped with lettuce, onion and tomato on a house-made potato bun. You can also add cheddar cheese for $1, which I did. The burger looked amazing when it came out. The patty and bun were proportional, although certainly smaller than the monster I got last week. I did however find myself running out of burger the more bites I took, so I tried to pace myself and only had about one bite at the end that was just bun. 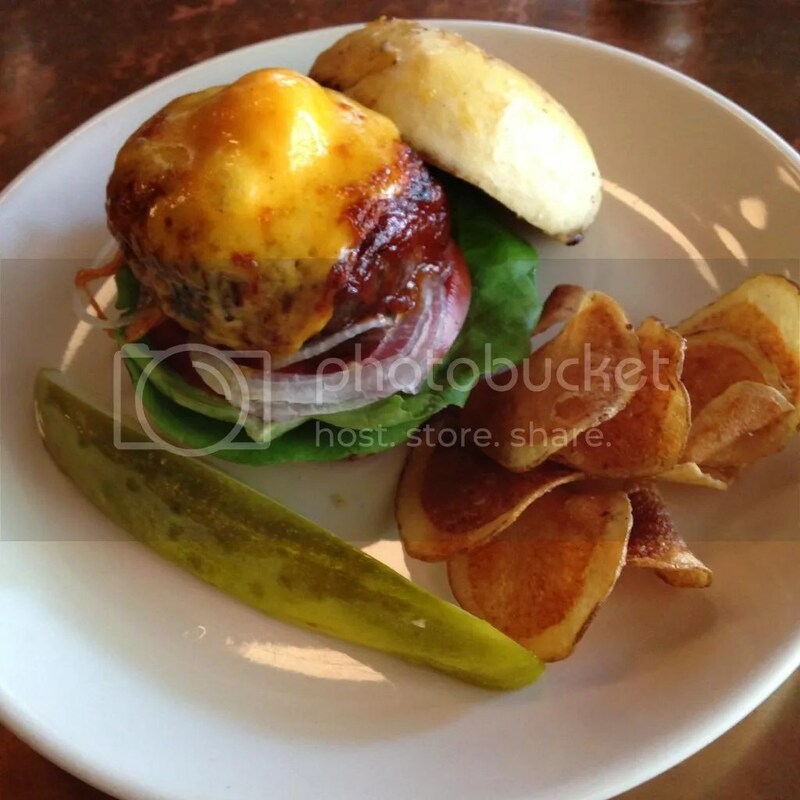 The house-made bun was nice and soft, and it was nice to see something other then a shiny brioche roll for a change. Since the burger patty was small and thick, it did come out slightly more on the medium-well side, but was very juicy and flavorful. It was also topped with some kind of house-made ketchup that was was ridiculous delicious. Paired with hand-cut potato chips and a pickle, it was the perfect treat for a Sunday afternoon, and definitely worth the expedited trip. Posted in brunch, buns, burger, cheddar, cheese, farmer's market, food trust, Headhouse Square, medium, no-frills, potato bun, Society HIll Society. Bookmark the permalink. Ever since Shake Shack touched down in Philly two years ago, a lot of other fast-casual burger chains have come to the area trying make an imprint on the burger scene (Smashburger, BurgerFi, Burger21, to name a few). So when Spike Mendelsohn of Top Chef fame announced he would be opening a branch of his DC based burger joint, Good Stuff Eatery, I was anxious to see how it would turn out. And then I became increasingly more anxious as the projected opening date being reported by local food blogs kept getting pushed back again and again. Finally, just in time for July 4th weekend – aka Philadelphia’s time to shine – the doors opened and the burger angels sang their siren song. 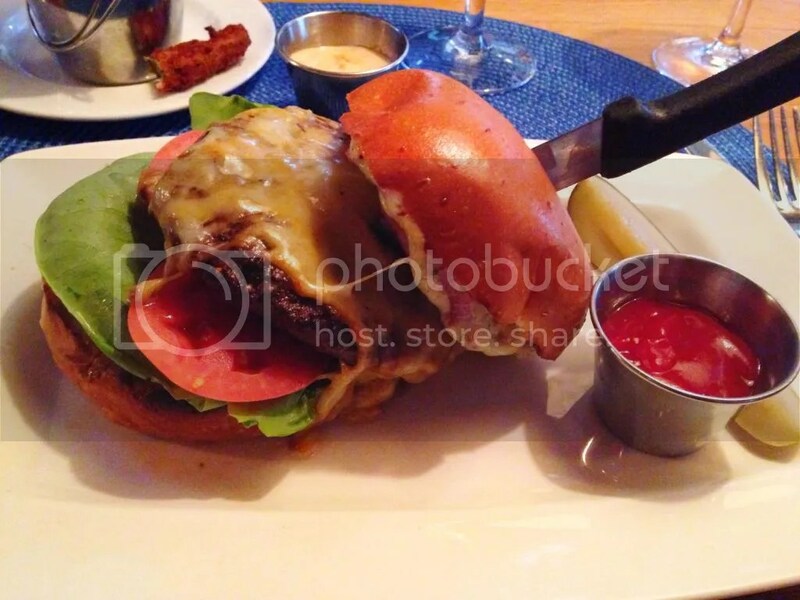 They have an assortment of burgers with specialty toppings on potato buns, as well as hand-cut fries and shakes. Sounded awfully familiar to me, so what would set Good Stuff’s burgers apart? First off, their burgers are a blend of short rib, chuck and brisket and a whopping 5-6 ounces. As far as the fries go, instead of using classic Idaho potatoes like some places, Good Stuff uses red bliss potatoes that are aged and then hand cut and double fried. And for your dipping delight, they’ve got a “mayo bar”, featuring Chipotle, Mango, Sriracha and Old Bay (a DC & Philly favorite). If you remember from my recent post about my trip to BurgerFi, I wasn’t pleased with them charging $13 for a burger, fries & a drink when you can easily get the same combo at Shake Shack or Five Guys for less. Good Stuff’s lunch special (running Monday-Friday from 11:30 AM-2:30 PM) features their Farmhouse Cheeseburger (topped with tomatoes, lettuce, onion, pickles and “Good Stuff Sauce”), fries and a drink for only $12! That sounded like a great deal to me and so, that’s what I opted to get. So, the first thing I noticed was that I was not given the Farmhouse Cheeseburger. I’m not sure if this was an oversight or if maybe the lunch special burger changes daily; either way, I wasn’t complaining. Checking the menu again, it appears I was given the Coletti’s Smokehouse burger: topped with Applewood Bacon, sharp Vermont cheddar, fried Vidalia onion rings & chipotle BBQ sauce. The second thing I noticed was how big the patty was. This thing was no joke! Five Guys gives you two patties off the bat and Shake Shack will let you add a patty and both of those barely come close to this bad boy (and honestly, I feel like less of a pig if I have one big patty instead of getting two). Thirdly, while I was not asked how I wanted my burger cooked, when I bit inside, it was a perfectly pink medium. Already this burger was leaps and bounds over its competitors! The cheddar was nice and gooey. The bacon, crispy. The BBQ sauce, tangy. The onion rings had a good crunch to them and weren’t too stringy. The bun, soft and proportional. Good Stuff Eatery was good stuff, indeed. I can’t wait to get back and check their burger out in its “pure” form. Posted in bacon, bbq, bbq sauce, buns, burger, burgers, cheddar, Good Stuff Eatery, medium, onion rings, potato roll, Top Chef. Bookmark the permalink. While making a weekend trip to South Jersey – for Wegman’s, obviously – we decided to pop into Zinburger, which happened to be in the same shopping center as the Wegman’s in Cherry Hill. Zinburger is a casual wine & burger bar, specializing in novelty burgers made of 100% certified Angus beef and American Kobe beef, which they grind in house three times a day. I didn’t want to go too crazy, so I ordered the Samburger – topped with Nueske’s Applewood smoked bacon, American cheese and 1000 island dressing. Then I checked out photos on Yelp and immediately changed my order to the Breakfast Burger: topped with a Fried egg, smoked bacon, American cheese, avocado & mayo (I know, I know. That burger should have been my first choice since those are all my favorite things). Just like at Bobby’s Burger Palace, when your server asks how you would like your burger cooked, they confirm back to you with the color & temperature of your order; in my case, Medium, warm pink center and warm throughout. The burger came out and looked amazing. The house grind meat had a great flavor and the patty was perfectly proportional to the bun. I made sure to keep the giant toothpick thing in the bun to hold everything together for a while so that the toppings didn’t spill out everywhere. The burger was slightly more on the medium-well side – I would have liked to see more pink inside – but it was very juicy. Normally I would ask for ketchup, but I didn’t even need any! I also wish the fried egg had been slightly runny instead of being cooked all the way. I was surprised how delicious it was for a “suburban chain”, considering my last South Jersey burger experience wasn’t so great. I’m definitely glad that I changed my order at the last minute. I would totally have regretted not getting this! The one downside would probably be that the burger doesn’t come with fries, but they have an assortment of onion rings & various fries that are the perfect size to split with another person – if you’re into that kind of thing. 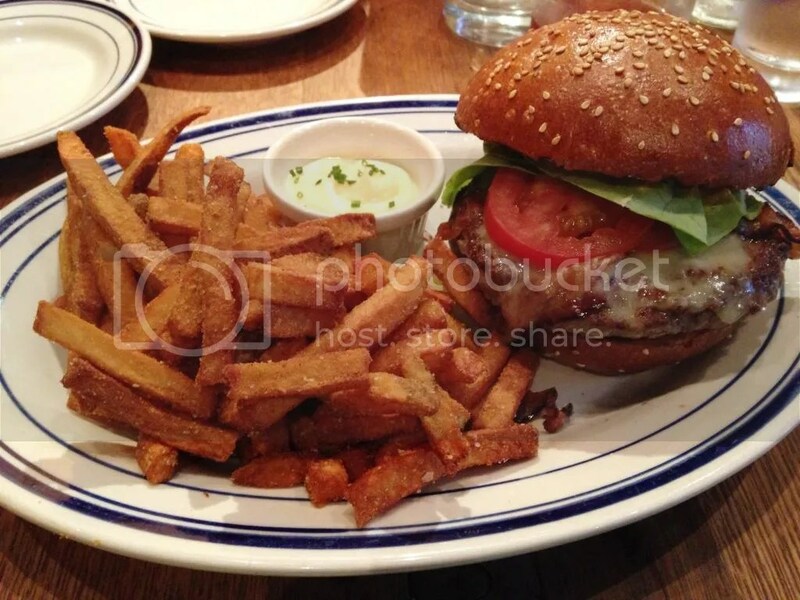 Let’s face it – no one likes food shopping on an empty stomach – so fuel up beforehand at Zinburger. They also have an all day Happy Hour on Sundays where you can get their simple burger for only five bucks! Posted in American cheese, Angus beef, avocado, bacon, bobby's burger palace, Cherry Hill, fried egg, medium, South Jersey, wine, Zinburger. Bookmark the permalink. I’d been meaning to check out Resurrection Ale House for quite some time. (And ironically, while completely unplanned and without Religious affiliation, I found myself venturing in just a few days after Easter.) Resurrection Ale House is tucked into the elbow of Philadelphia known as Grey’s Ferry and is brought to you by the same lovely folks who run Strangelove’s & Memphis Taproom. 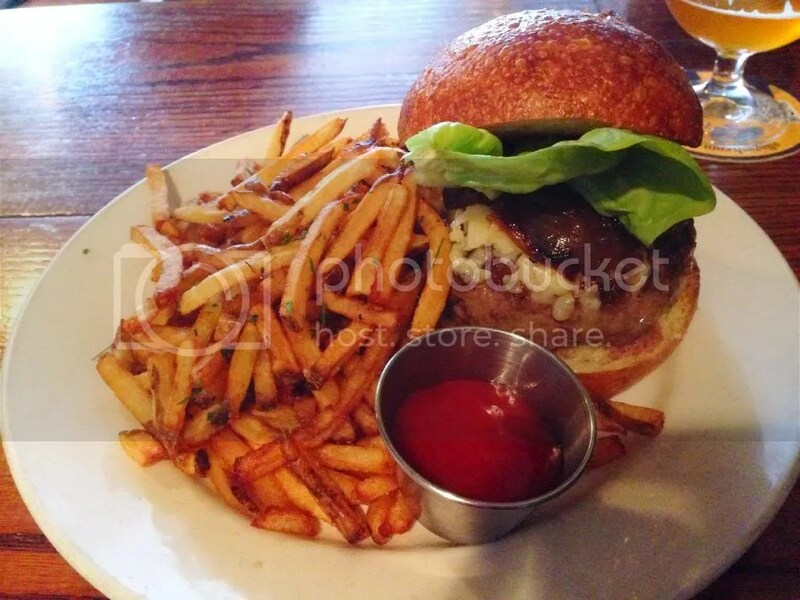 This burger however varies slightly from their previously sampled siblings, coming topped with cheddar, caramelized onions and bibb lettuce all tucked under a challah bun. You can add bacon for a $1, but as I had bacon on both the Strangelove’s & Memphis burgers, I figured I’d keep it simple this time. While other places that I’ve ordered similar burgers from haven’t appeared to take their time when it comes to caramelizing onions, these were spot-on: dark brown and gooey, like a good caramelized onion should be. 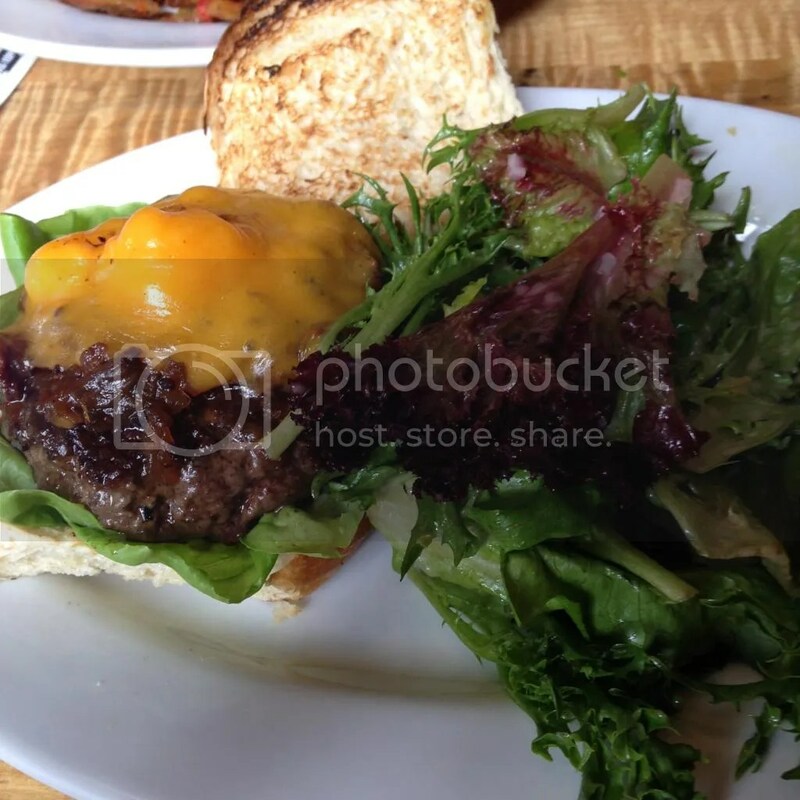 The burger was cooked perfectly medium, and the meat was juicy and flavorful. The challah bun gave it a soft, buttery balance and the bibb lettuce literally became like a bib, holding back the meat drippings. The patty was big and thick and had a good burger-to-bun ratio; I only had about one final bite at the end where I had run out of meat. I was definitely pleased that this burger carried the same “genes” as its burger brethren. Being able to find consistency at three separate locations in three different areas of the city is quite a feat! I can’t wait to try the burger at their fourth location in West Philly – Local 44 – and see if it matches the rest, or if it’s the black sheep of the family. Posted in buns, burger, burgers, caramelized, challah, cheddar, Grey's Ferry, lettuce, medium, Memphis Taproom, onions, Resurrection Ale House, Strangelove's. Bookmark the permalink.